The Launch Control XL is a brilliant controller for Ableton Live and is perfectly usable for other applications, too. Painless to set up. Solid build quality, sensibly designed. Ableton Live Lite included. Editor software adds flexibility. The ability to modify Send knobs would have been useful. Can't modify knobs at all in User mode. 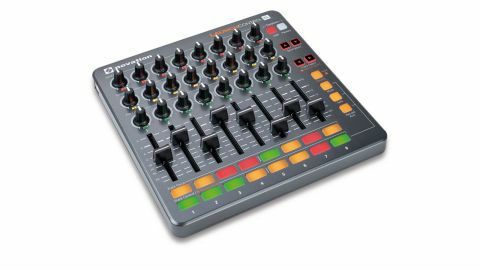 A member of Novation's Launch range of dedicated MIDI controllers for Ableton Live, the Launch Control XL expands on the original Launch Control - which featured a rather meagre eight pads and 16 knobs - to make a more fitting companion unit to the Launchpad S.
The two are the same size, and the XL does for Live's Mixer what the S did for Clip launching, offering plenty of hands-ons control in a straightforward, compact unit. First impressions are great: the Launch Control XL's roughly 9.5" square plastic casing feels surprisingly rugged, and its natty orange rubber base should help defend it somewhat from the rigours of life on the road. "The sturdy design makes it ideal for live performance, but it's quite at home as a mixing tool in the studio too." The face of the unit features 24 knobs, eight faders, 16 pads and ten buttons, and the build quality throughout is absolutely top notch - although the knobs might be a touch stiff for some. You also get a USB cable in the box, as well as 1GB of Loopmasters samples and Ableton Live Lite. Being a class-compliant device, installation couldn't be easier: simply plug it in. The XL is divided into eight channels, each with a volume fader, knobs for Pan, Send A and Send B, a Track Focus button and a Track Control button. Pressing Track Focus on a channel selects that channel's strip in Live, as if you'd clicked on it, while Track Control has three modes of operation, selected using the buttons on the right-hand side of the unit: Mute, Solo and Record Arm - it's all very straightforward. The Track Select buttons jump the whole controller between banks of eight channels in Live: 1-8, 9-16, 17-24 and so on. The Device modifier button switches the Pan knobs into Device mode, under which they control eight of the currently selected plugin's parameters. Further parameters can then be accessed by holding down the Device button, which turns the Track Control pads into Device Bank selectors, each with its own Pan/Device knob assignments. In the case of EQ Eight, for example, the first bank sees the knobs controlling each band's on/off state, the second band frequency, the third band Gain, and so on. This setup would be much better if the Send A and Send B knobs could also be used for device control, but as it stands, the only way to get access to all of the controls is to create a user template - see Template of Dreams. When held, the Device button also turns the Track Select buttons into Device Select buttons, which cycle through the instruments and effects on the currently selected track. So, once you've got the hang of how the modifiers work, you can select any device on any track and tweak its parameters without touching your mouse or keyboard. There are also two Send Select buttons for selecting which sends in Live the Send A and Send B knobs control. The Launch Control XL is a very well thought-out controller that packs a lot into its relatively tiny surface area. The sturdy design makes it ideal for live performance, but it's quite at home as a mixing tool in the studio too. It feels like a bit of a missed opportunity that the Send knobs can't be used to control device parameters like the Pan knobs can, but that's certainly not enough of an issue to prevent us giving it our wholehearted recommendation.